Own algorithm: i-Search will index your site and build his own algorithm to provide high-speed search results. Search queries in 10.000 Products and over 18.000 tags are provided in milliseconds. Logging: i-Search will log every not found search query and provide the administrator a better post/page/product optimization. Search tags: Like WP own post tags you can add extra search terms to your posts. Did you mean strings: The administrator can add for every not found search query a ‘Did you mean’ string. 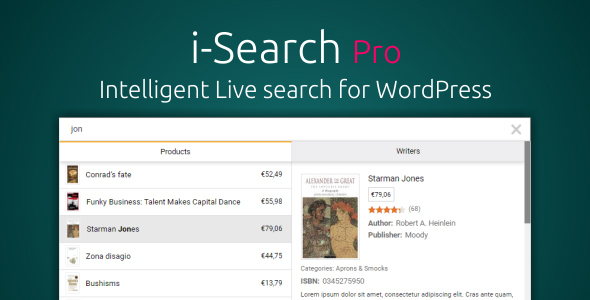 Popularity index: i-Search will create a ‘popularity index’ based on users search queries and clicks. The search results are ordered by the popularity index. Popular searches: Never say ‘Nothing found’ to your visitors! i-Search will show today’s popular search strings instead of ‘Nothing found’. Filters: You are no longer restricted to the creators choice. With intelligent filters, you are now able to show in the suggestions your own choices like SKU, Author… any information you want. Tabs: Don’t dump your visitors with mixed types of posts. i-Search provide you “TABs” in the suggestions for a better user experience. Templates: i-Search have 2 templates. 1. is a clean template and 2. is an advanced template with more information. Mobile fallback: i-Search detects mobile browsers and do a fallback to the clean template to provide a better user experience on mobile devices. Spam Protection: i-Search can detect spammers and disable logging for spammers. No need for coding: i-Search (if enabled in the settings) hooks automatically to WordPress search fields. Or easily by adding a shortcode you can add i-Search anywhere. Replace the WP search engine: WordPress looks only in the post title and post excerpt for search results. But with i-Search, you can add search tags and bypass the WP search engine (if enabled in the settings) to provide better search results and in High-Speed. Takes care of your server: i-Search creates the images by the selected size on the fly (if not exists) and deletes the old images (created by i-Search) if you change the image dimensions. Most of the plugins leave the images on your server. Images you never need but take serious size on your server. With i-Search you can analyse your customers search queries (Not found search results). Do you know what your customers searched for and maybe not found it? You will be able to know it with i-Search. Optimize your products keywords based on i-Search analyse table. This entry was posted in Wordpress Plugins and tagged ajax live search, ajax search, ajax search wordpress, best search wordpress, depositfiles.com, download free, download plugin.rar, download plugin.zip, download rar, download wordpress plugin, download zip, free, free wordpress plugin, get rar, get zip, Index Of, live search, live search for wordpress, mirrorcreator.com, nowdownload.ch, nulled, nulled plugin, Parent Directory, rar, search, ul.to, woocommerce, wooCommerce ajax search, WooCommerce Live Search, woocommerce search, wordpress plugin, zip, zippyshare.com by wordpress. Bookmark the permalink.